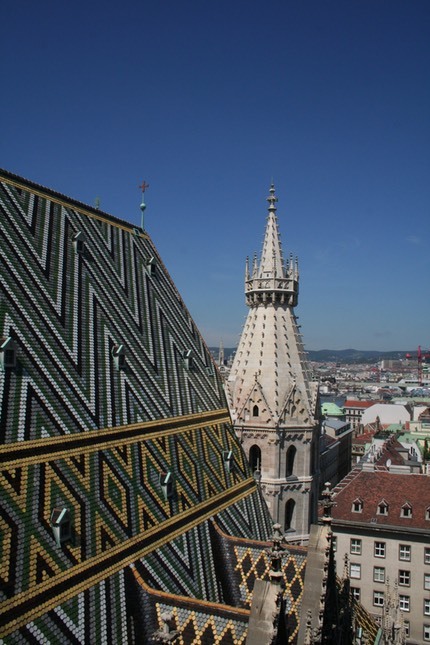 To Vienna for a long weekend, fleeing the awful weather in the UK. We arrived on Thursday evening and after a taxi transfer from the airport were soon installed in our small hotel about 20 minutes walk from the centre. Jonna had found a nice restaurant with a courtyard where we tucked into a couple of local specialities with some Austrian wine (no anti-freeze jokes - it was very nice). The following day we set about sightseeing in the centre and managed to see everything we wanted in the blistering heat that had arrived for us. The cathedral is very impressive and free to enter, but you can pay extra to go up to the bell tower and down into the catacombs. Both are worth doing. The view from the top is 360 degrees and the catacombs have plentiful supplies of bones from plague victims. 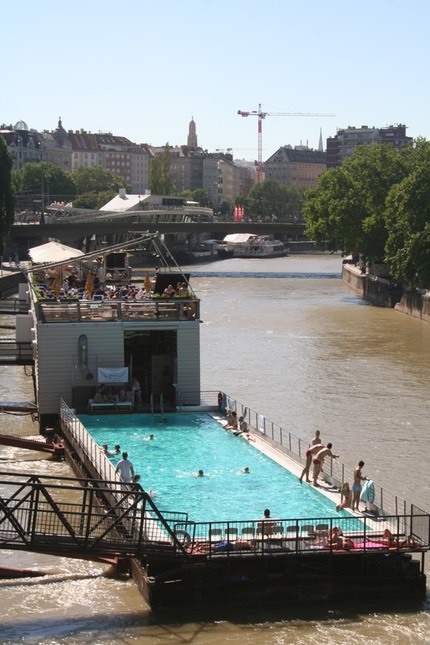 Saturday turned out to be even hotter than Friday, so having had a successful day with the sights we headed to the BadeSchiff, a floating swimming pool and sun deck on the Danube canal. This is a really innovative idea and with super cool water was a very refreshing day. If only the weather was better in the UK we could have one on the Thames. After a sensible Saturday night eating at a superb restaurant in the centre of the city we headed for the Tiergarten and Vienna Zoo, apparently the oldest in the world. Again it was boiling hot so many of the animals were hiding away, but the Pandas were very active eating bamboo and the Spectacled bears were great. 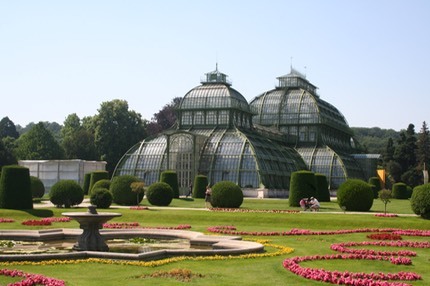 This picture is of the Palm House, modelled on Kew gardens. 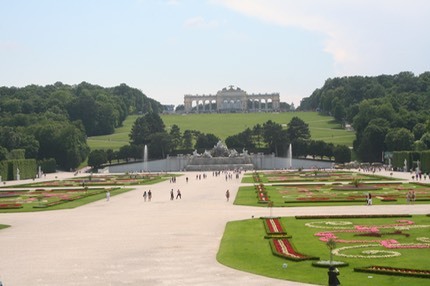 The Austrians are very precious of their grass and locals will shout at you if you walk on it. Funny! 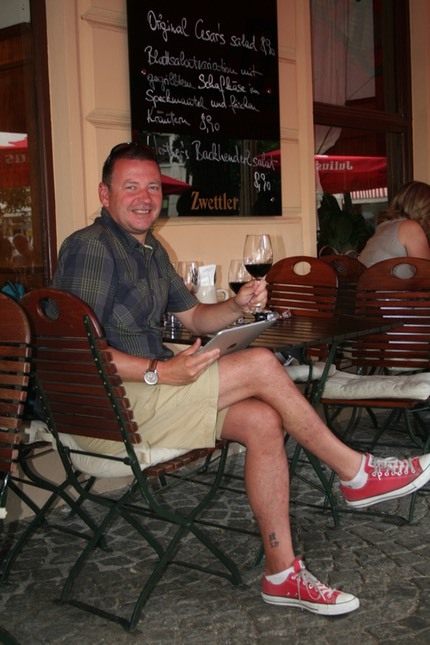 A final shot of me relaxing before we headed back to the airport.